the Heliocentric Planetary Aspects and Transits software. 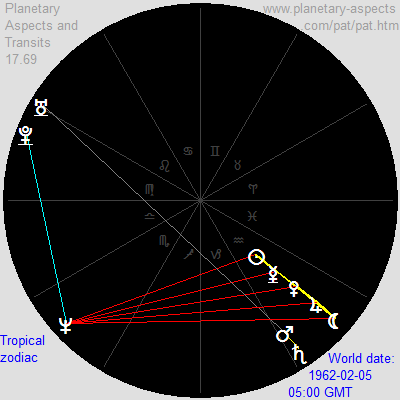 Two planets form an aspect when their degree of separation (the absolute difference of their longitudes) is sufficiently close to one of the following: 0° (conjunction), 180° (opposition), 90° (square), 120° (trine), 60° (sextile), 30° (semisextile) or 150° (quincunx). Astrologers also recognize other aspects, not dealt with here, such as 45° (semi-square). A certain inexactness is permitted, which is called the orb. Thus if an orb of 10° is used then two planets are conjunct if they are separated by less than 10°. They are opposite if their separation is less than 10° from 180°, they are square if their separation is less than 10° from 90°, they are trine if their separation is less than 10° from 120°, and so on. For example, if a certain planet's longitude is 35° then another planet will be square to it if the second planet's longitude is anything between 115° and 135°. Most astrologers study geocentric astrology, where the longitudes of the planets are measured from the point of view of the Earth. There is another kind of astrology, called heliocentric astrology, in which longitudes are measured from the point of view of the Sun. The aspects in the two kinds of astrology are the same. 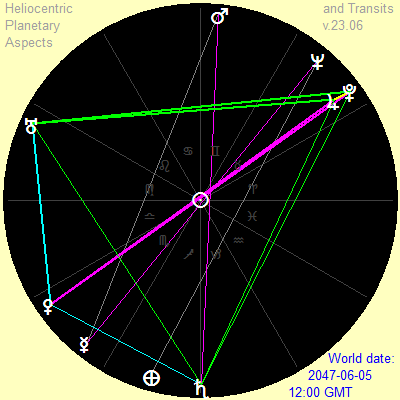 For example, a heliocentric chart is shown at right. Most of the charts below are geocentric (made with PAT), with a few heliocentric charts (made with HPAT). The exactness of an aspect is expressed as the difference between the actual angle separating the planets and the ideal angle of separation for that aspect. For example, if Mercury has longitude 55° and Mars has longitude 57° then the exactness of that conjunction is 2°. 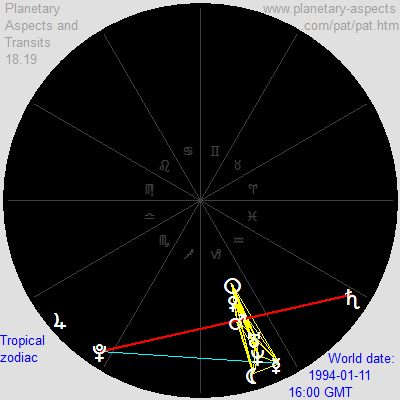 If Venus has longitude 80° and Jupiter has longitude 195° then they form a trine aspect with an exactness of 5° (= 120°-(195°-80°)). 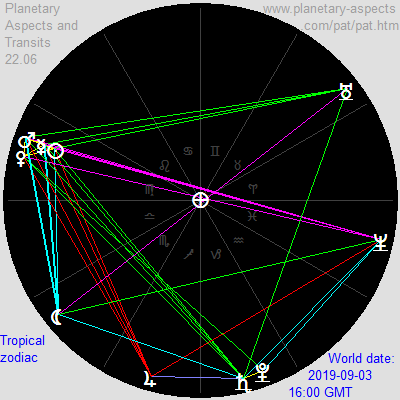 The sample screenshot given in the Introduction shows all the planetary aspects at June 9, 2010 (using the default values for the orbs) together with how close to exact those aspects are. When three or more planets are such that each planet forms an aspect to each of the other planets then we have what is called an aspect pattern. An aspect pattern with three planets involves three aspects, an aspect pattern with four planets involves six aspects, and an aspect pattern with five planets involves ten aspects (these being very rare). The main aspect patterns are described below. If we consider only non-zero aspects (that is, aspects other than conjunctions) and only aspects divisible by 30, then there are 12 possible 3-planet aspect patterns, 28 possible 4-planet aspect patterns, 35 possible 5-planet aspect patterns, and 35 possible 6-planet aspect patterns. 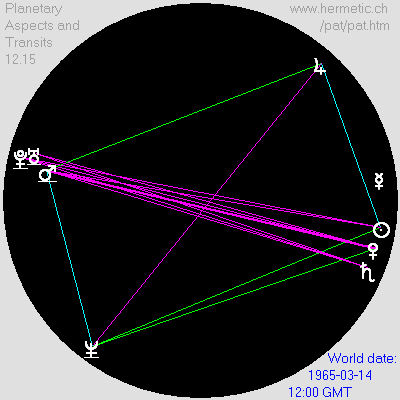 The total number of such aspect patterns with 3-6 planets is thus 110. Only the more common ones have names, and some are probably so rare that they will never be seen. 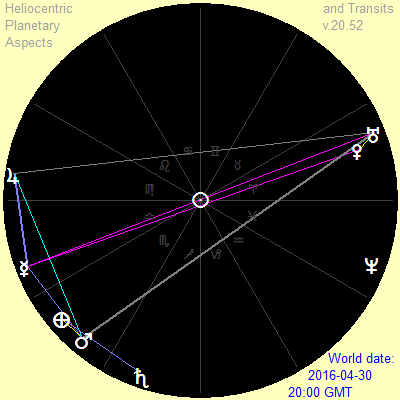 A 3-stellium occurs when three planets are all conjunct to each other. An n-stellium occurs when n planets are all conjunct to each other. 3-stelliums are fairly common (because Mercury remains close to the Sun), but it is rare for more than one 3-stellium to occur at one time. 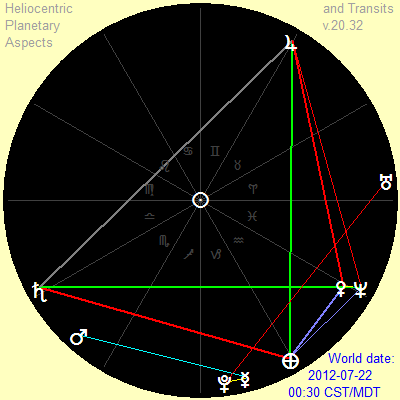 Here is an instance of three heliocentric 3-stelliums occurring simultaneously (along with eight T-squares). This takes place on October 25, 2020. 4-stelliums involving the outer planets are much rarer because they move more slowly than do the inner planets. Here is an example of a heliocentric 4-stellium, Mars-Jupiter-Saturn-Pluto, which lasts from May 21 through June 4, 2020, and is most exact on May 26, 2020. 5-stelliums are rare, occurring perhaps once in a decade or two. Shown at right is a 5-stellium (Sun-Mercury-Venus-Jupiter-Moon) which occurred on Feburary 5, 1962. This 5-stellium is unusually tight; the average of the pairwise separations of the five planets reaches a minimum of just 1°21'. 5-stelliums also occur on May 9, 2000, and on September 8, 2040. In these two cases the minimum separation is between 4° and 5°. Stelliums are less common in heliocentric planetary configurations because the Moon is not included. If, however, we allow an orb of 12° for conjunction then the heliocentric 5-stellium shown at right (Me-Ve-Ma-Ur-Ne, with Earth opposite all five) occurred on January 6, 1994. 6-stelliums are very rare. Shown at right is a 6-stellium (Mercury-Venus-Jupiter-Uranus-Neptune-Moon) which occurred on February 6, 1997. 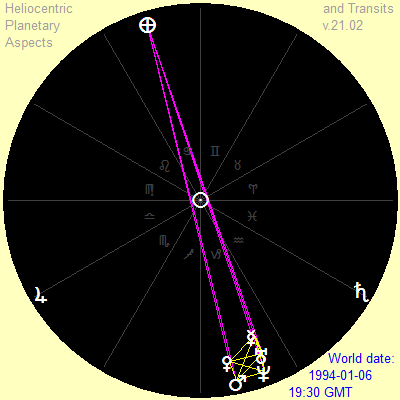 At 17:30 GMT all six celestial objects were separated by 8°58' or less. There are also four trapeziums present. 7-stelliums are extremely rare. 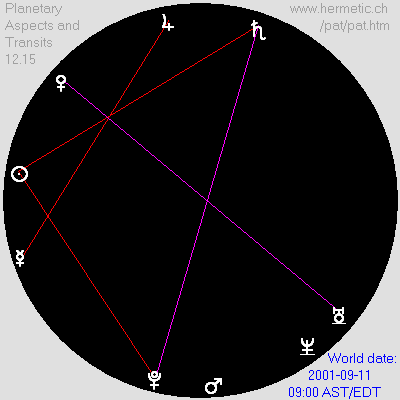 Shown at right is a 7-stellium (Sun-Mercury-Venus-Mars-Uranus-Neptune-Moon) which occurred on January 11, 1994. 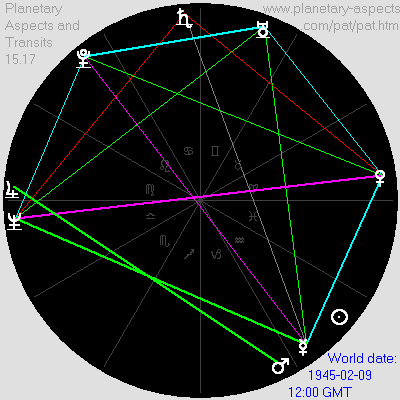 At 16:00 GMT all seven celestial objects were separated by 8°50' or less. A grand trine occurs when three planets are such that each pair of planets forms a trine aspect. This is considered auspicious. 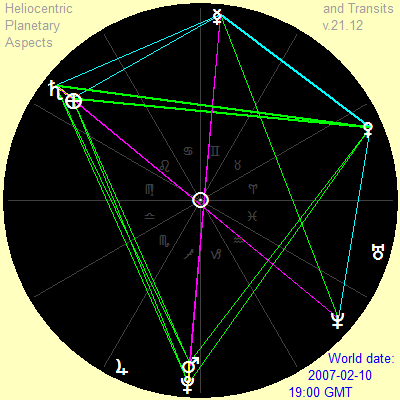 Here is an instance of two grand trines (Venus-Saturn-Pluto and Mars-Jupiter-Uranus) which occured on September 22, 1904. 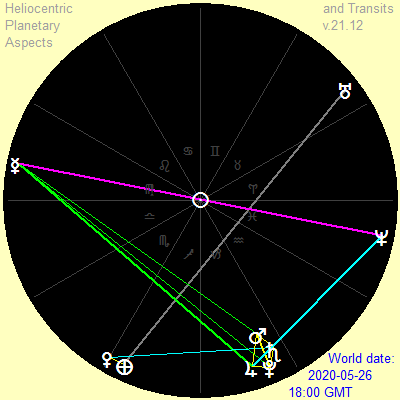 A very rare instance of a two heliocentric grand trines involving Jupiter, Pluto, Saturn and Uranus is shown at right. 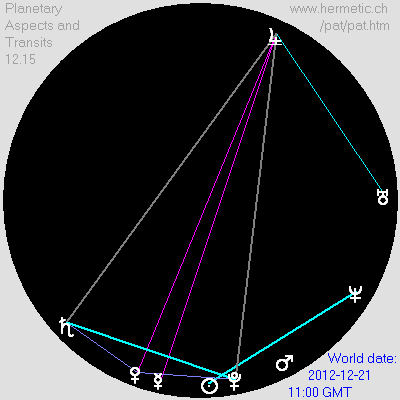 This planetary configuration (which occurs on June 5, 2047) also includes (with Venus) two kites. A grand sextile occurs when there are six planets, each of which is sextile to exactly two others, and these six planets also form two grand trines such that each planet in one grand trine is opposite to some planet in the other grand trine. Grand sextiles are very rare. Here is one, formed by Jupiter, Venus, Saturn, Pluto, Neptune and the Moon, which occurs on July 29, 2013. Another one is shown below. Grand sextiles, like all aspect patterns, can also occur in heliocentric planetary configurations. An example is shown at right, formed by the Earth, Mercury, Venus, Mars, Jupiter and Neptune. This configuration also includes three yods and a yod-kite. It occurred on October 10, 1621. A kite occurs when three planets form a grand trine and a fourth planet is opposite to one of them and is sextile to the other two. Here is an instance of a kite consisting of a grand trine formed by Mars, Jupiter and Uranus, with the Sun opposite Jupiter and Jupiter sextile to Mars and Uranus. This kite occured on May 9, 2006. 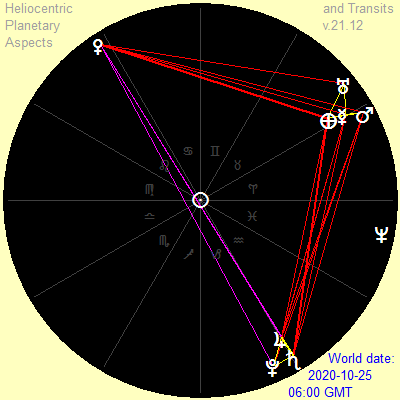 Here is an instance of two kites (and thus two grand trines) formed by (i) Mercury, Venus, Neptune and Saturn and (ii) Mercury, Venus, Neptune and Uranus. This occurred on November 30, 1941. 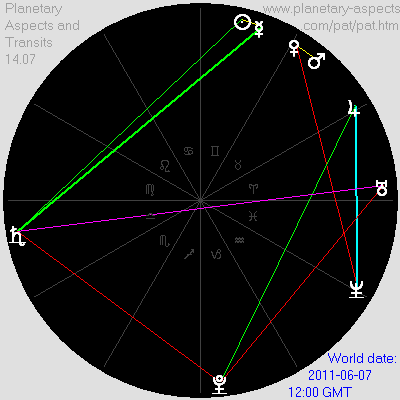 With a slightly larger orb of 8° for trines there is a third grand trine formed by the Sun, Mars and Pluto. 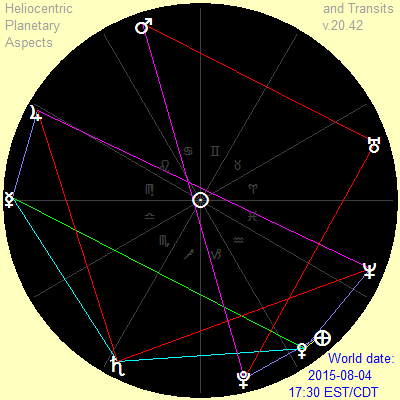 Here is an instance of a heliocentric kite consisting of a grand trine formed by Earth, Jupiter and Saturn, with Mars opposite the Earth sextile to Jupiter and Saturn. (There are also two conjunctions: Me-ve and Ur-Ne.) This kite occured on December 22, 1993. Here is an instance of four heliocentric kites and two trapeziums. 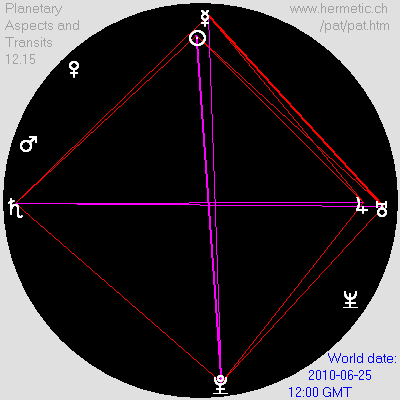 This alignment occured on February 10, 2007. A T-square occurs when three planets A, B and C are such that A is opposite to C and B is square to both A and C. The image at right shows the T-square at 09:00 EDT on September 11, 2001. 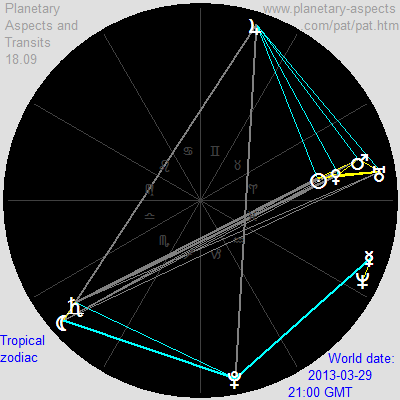 A screenshot in the Introduction shows three T-squares, in particular the Saturn-Pluto-Uranus T-square (which, using an orb of 10°, began on February 9, 2010, and will last until October 4, 2010). This T-square is part of one of the grand crosses shown in the image below. A grand cross occurs when four planets, A, B, C and D are such that A is opposite C, B is opposite D, A is square to B, B is square to C, C is square to D and D is square to A. This is cause for alarm. Here is an instance of not just one but four grand crosses (Su-Ju-Pl-Sa, Su-Sa-Pl-Ur, Me-Ju-Pl-Sa and Me-Sa-Pl-Ur), which occured on June 25, 2010. 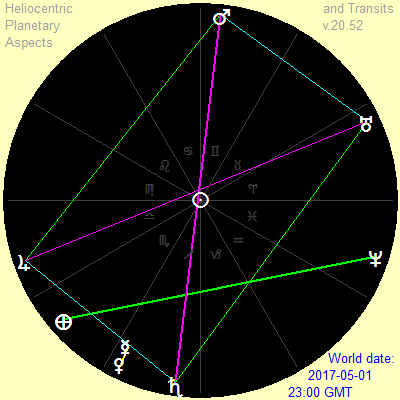 Here is an instance of two heliocentric grand crosses (Ea-Ve-Pl-Ur and Me-Ju-Sa-Ne ) which occurs on January 7, 2016. 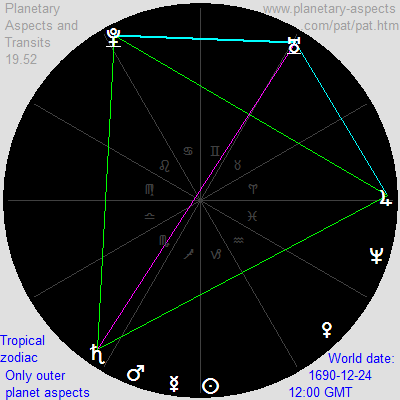 A yod is an aspect pattern formed by three planets, A, B and C, where B forms quincunxes (150° aspect) with A and C, and A and C are sextile (60° aspect). Here is an example of two yods (Me-Sa-Ve and Ma-Su-Ur) occurring simultaneously on April 24, 1982. 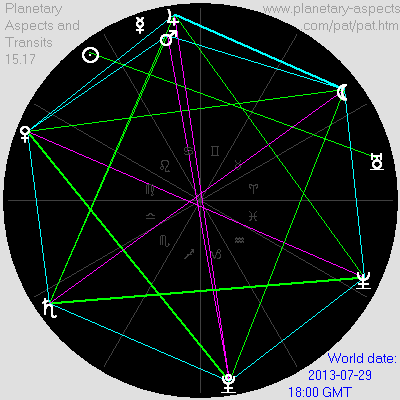 Here are ten yods occurring simultaneously, on March 29, 2013. The large number of yods is due to the conjunction of Saturn and the Moon, and the 4-stellium formed by the Sun, Venus, Mars and Uranus. A yod kite is similar to a kite, but instead of three trines plus a fourth planet opposite to one of them, a yod kite is a yod with a fourth planet opposite to the planet at the vertex of the quincunxes and semisextile to the other two. Here is a yod kite (Su-Sa-Ne-Ur) which occurred at the time of the Deepwater Horizon blowout (22:00 CDT on April 20, 2010). 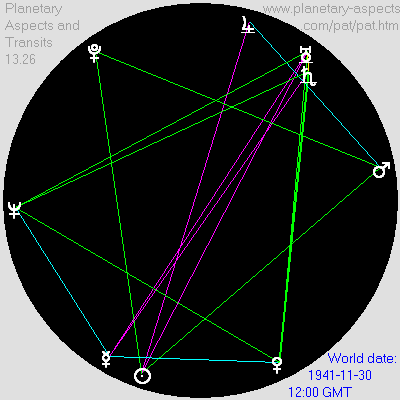 At right is another yod kite (Sa-Ju-Pl-Ve) which begins at midnight GMT on December 20/21, 2012, and lasts until December 25. Yod kites are unusual. By means of this software the following can easily be confirmed: During the twelve years 2007 through 2018 there are only eleven yod kites. There are none in the years 2008, 2009, 2011, 2013, 2014 and 2016 through 2018. In 2007 there was one yod kite (February 12-14), in 2010 there are six, in 2012 there will be three (all in December), and in 2015 there will be one (May 19-22). They last on average four days. In these twelve years yod kites were present on forty days, so during this period the probability of a yod kite being present on a given date is less than 1%. 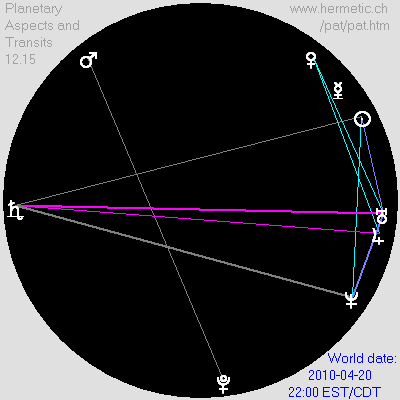 If we allow sextiles and semisextiles to have an orb of 6° then on January 19, 2162, the following planetary configuration occurs. The 31 aspects form a grand trine, a rectangle, three T-squares and a yod-kite. A rectangle (a.k.a. a mystic rectangle) occurs when four planets A, B, C and D are such that A is opposite to C, B is opposite to D, A is sextile to B and trine to D, and C is sextile to D and trine to A. Here is an instance of a heliocentric rectangle, Ma-Sa-Ju-Ur, which occurs on May 1, 2017. 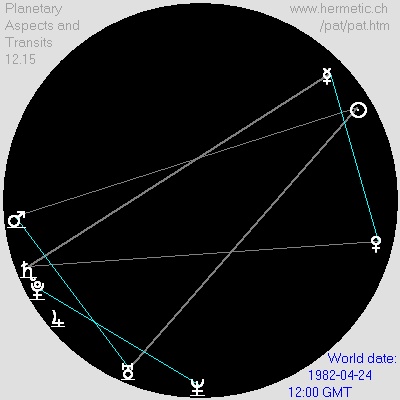 Here is an instance of a geocentric rectangle, Su-Ma-Ne-Ju, which occurred on March 14, 1965. With slightly larger orbs for trines and sextiles there are three additional rectangles (Su-Pl-Ne-Ju, Ve-Ma-Ne-Ju and Ve-Pl-Ne-Ju). There are at least three kinds of trapezium, each with four planets and six aspects. 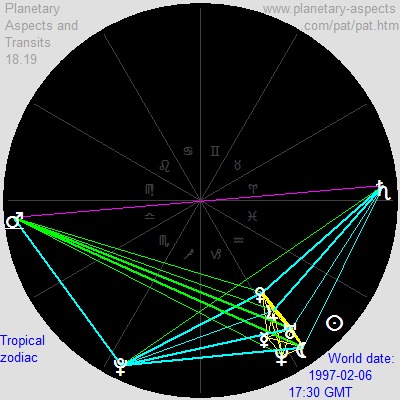 A very unusual planetary arrangement occurred from February 6, 1945, through February 13: Two such trapeziums (Me-Pl-Ur-Ve, Ve-Pl-Ne-Ur), two kites (Ne-Me-Ur-Ve, Me-Ur-Ne-Pl), a T-square (Ve-Sa-Ne), a grand trine (Me-Pl-Ur-Ve) and a rectangle (Me-Pl-Ne-Ve), with all and only the outer planets retrograde. This arrangement coincided almost exactly with the Yalta Conference (a meeting of Roosevelt, Churchill and Stalin), which took place from February 4 through February 11. When the Moon is included we find that on February 7, 1945, there was an even more unusual planetary arrangement, which included a very rare grand sextile (Me-Ur-Ne-Ve-Pl-Mo). And on February 9 the Moon was part of both a grand cross and a yod. The image at right shows such a trapezium formed by the Moon, Mercury, Uranus and Pluto. This occurred at 14:00 GMT on August 18, 2012. D square to C and trine to B. Such a pattern has been found in a heliocentric planetary configuration (shown at right), but not so far in a geocentric one. D semisextile to C and square to B. D sextile to C and quincunx to B. Such a pattern occurred in the geocentric planetary configuration of July 15, 2017 (shown at right). Since the diamond aspect pattern was present on July 20, 2012, at the time of the mass murder by James Holmes in Aurora, Colorado, it might better be named a distorted pentagram. It consists of five planets. 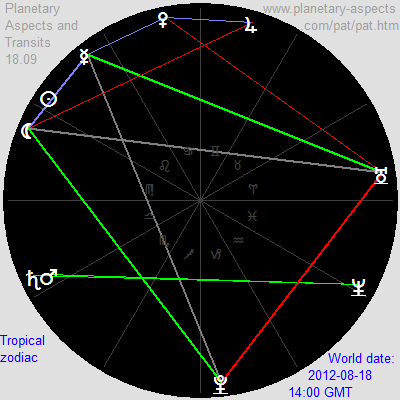 It is formed by the juxtaposition of a trapezium and a T-square, with the planets of the trapezium that are in opposite aspect being the same as those in the T-square, plus two quincunxes, between the planet at the focus of the T-square and the two planets in the trapezium which are not in the T-square (thus forming a yod). This is illustrated in the diamond shown at right (which includes the Ma-Me-Ju-Ur trapezium), which occurred at 00:30 on July 20, 2012, the time of the aforementioned mass murder. Diamond aspect patterns are rare. A not-quite-perfect diamond occurs on July 30, 2013 (a single quincunx is missing). The next diamond occurs around June 21, 2017 (it begins at 06:00 GMT on June 19 and ends at 02:30 GMT on June 21). An arrangement of three planets is called a midpoint if no two of them are conjunct and the position of one of them is within a specified range (the midpoint orb) of the exact midpoint beween the other two. There are actually two exact midpoints (called the near midpoint and the directly opposite far midpoint), and the intermediate planet can be located at either of them. 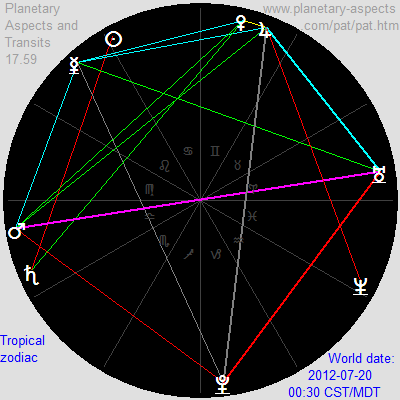 A midpoint is not an aspect because it involves more than two planets, and it is not an aspect pattern because the planets involved do not have to form aspects with each other (though they may, e.g., in a T-square). 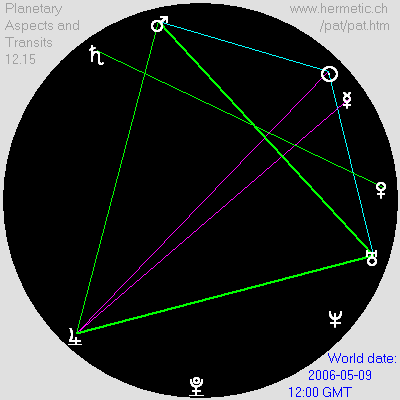 Nevertheless a midpoint is considered significant by many astrologers. 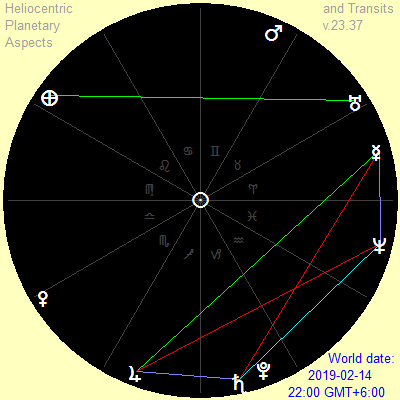 The image at right shows three midpoints which will occur on June 7, 2011: Mars midway between Mercury and Jupiter, Jupiter midway between Venus and Uranus, and Saturn midway between Mars and Neptune.